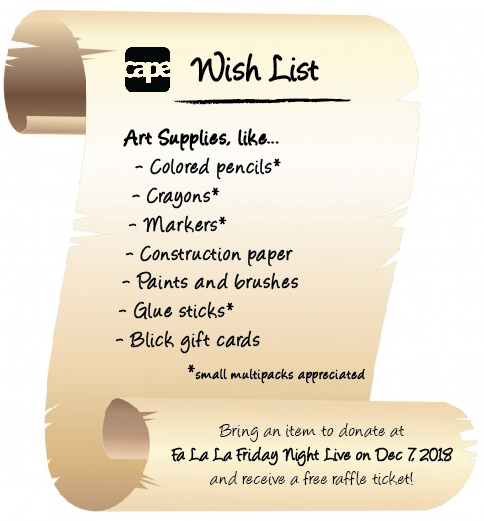 Get in the holiday spirit at Fa La La Friday Night Live, a variety show and fundraiser hosted by CAPE’s Associate Board and featuring hilarious, amazing, and downright delightful performances by an assortment of Chicago performers! Center on Halsted (3656 N Halsted St, Chicago, IL 60613) Center on Halsted is the Midwest’s most comprehensive community center dedicated to advancing community and securing the health and well-being of the LGBTQ people of Chicagoland. Center on Halsted also serves as an incubator for a number of smaller LGBTQ non-profit organizations and provides operational support, space and resources for organizations that may otherwise find it difficult to interact and grow. Don we now our cheesiest holiday attire! Performers for Fa La La Friday Night Live include The Storefront, Teen Cudi, Sonal Aggarwal, Lawless Fury, Ray Glass, and Katie Bates! Click the ‘Register’ button below to get your tickets or simply make a donation. Then click here to invite your friends through Facebook! The Storefront is an exciting and growing comedy troupe established out of an abandoned storefront in the West Town neighborhood of Chicago, IL. We slowly built a repertoire along with our own fast-paced style, initially through shows produced out of the 50 seat underground theater and stage we built ourselves in what became known as “The Storefront,” and then cultivated that style with shows in many of Chicago’s premiere comedy theatre spaces. now established as the “pickup basketball game of comedy,” we not only produce several storefront comedy shows but also host, feature and collaborate with a variety of performers throughout Chicago. Black kids rarely get to have fun. They’re too busy stumbling upon dead bodies in John Singleton films, or being the snarky mentee for single white leads in romantic comedies, or being the one diverse kid in a small town where aliens are going all kinds of crazy. Teen Cudi (Devin Middleton & Jordan Stafford) are two black boys who just want to be silly and maybe a little thought provoking, but mostly silly because neither of them are sociology professors at this time, and life is hard enough. …not a suitable marriage candidate, but she’s a great comic. She is a world traveling performer. Raised in the southwest suburbs of Chicago, she left the country after college to travel the world. In March of 2015 while living in India as an artist and emcee, her life took a dramatic turn with a motorcycle accident that led her back to Chicago. During her rehabilitation, she realized that she was meant to do stand up comedy. Now, her infectious energy is on stage all over Chicago. You can currently see her performing her one-woman show “The Alchemy of Bliss” at the Steppenwolf Theatre in Chicago. Ray Glass is a Chicago-based writer, performer and graphic designer. She graduated from Columbia College Chicago with a BA in Comedy Writing & Performance and has completed the Second City Conservatory, Second City Comedy Studies Program, Annoyance Improv Program and iO Improv Program. You can catch her around the city performing solo musical comedy, songs from her recent project, Sped: The Musical and improv with Love, Improvised and The Ghosts. Lawless Fury is on the run. She just broke out of Cook County Jail and is hopping from club-to-club disguised as a drag pop star. She was last seen playing the NYC Fringe Festival, and Duke University’s industry showcase, and authorities have reason to believe she is going to play you…ALL!!!! This is your warning folks: It’s about to get severe up in here. Katie Bates is a soul/hip-hop/R&B vocalist & songwriter, with roots in Chicago blues & gospel music. Bates writes and performs pieces about self-love & social consciousness with signature quirk, grit, humor and attention to lyrical detail. Her writing & vocals have been featured on projects with Mix Kitchen Studios, local hip-hop artists DJ Don Cheetah and JAYEM, and Get It Crockin’ (Chicago’s newest crockpot cooking show). Bates has performed original music solo and with various bands at such venues as Lincoln Hall, The House of Blues, Schuba’s Tavern, Buddy Guy’s Legends, and Uncommon Ground. She is currently performing in seasonal shows with the Chicago Queens of Rhythm & Blues and developing her first EP. For the latest on her life & music, follow her on Instagram at @katieqbates .